Convention is given the challenging task of finding a way to meet the needs of thousands of teachers at one time. My hat’s off to the committee for doing an incredible job of organizing everyone and doing exactly that. Were someone to ask me to do the same, I think I’d find a way to do an awkward shuffle away from the conversation. Truthfully, any speakers welcomed in – from last year’s passionate and polarizing Alfie Kohn to this year’s optimistic and enthusiastic Jack Berckemeyer – are going to have both fans and critics. I appreciate the speakers and the conviction they bring, but what I equally get from convention is often found in the hallways. It’s the people who teach across the street from me in a school that feels like an entire division away from me (because it is), or sometimes even the people who teach down the hallway from me that I still don’t get to plan with as often as I’d like. For as interpersonal as teaching is, I’m far from the only one who’s commented on how lonely it can be at times. Isolating may be a better word. 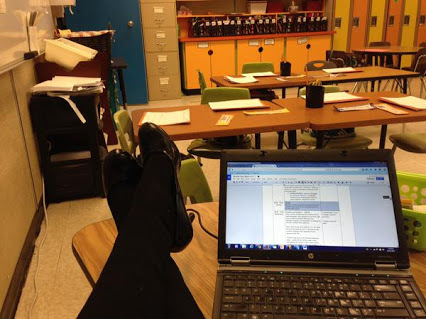 Sometimes, I feel like I know so little about what other teachers do in their classrooms. The last time that I was really able to spend quality time in another classroom was in my internship. But I wasn’t finished learning! Lately, with the rise of #saskedchat and the teams driving local edcamps – hosted at various times by YQR, PBS and RCSD, but each open to all – these boundaries are feeling even more arbitrary. I was (sadly!) sick and missed Pilot Butte’s camp, but at last week’s edcampYQR, I sat in on a great session about using eportfolios and Evernote from Kelly. Next up was a round-table discussion about teacher collaboration with representation from Regina Public, Regina Catholic, Prairie Valley and Southeast Cornerstone (like my mom! ), free agents and pre-service friends from the U of R. And that’s likely missing a few. I ran into an colleague from many years ago and ended up in a side conversation about my thesis and our internship experiences before moving into a room talking about #saskedchat. Attendance on these Saturday sessions can vary, and they certainly wouldn’t fill up the Connexus. But both days were filled with many people who wanted to be there and who had great things to share. Jack said it best at his keynote session on Convention. As teachers, we can be pretty vocal about the professional development we’re given and assigned, and there’s often validity in it (both the PD itself and the criticism). But we need to step up. There is so much expertise all around us, and we need to listen to it. We need to celebrate what we do! And our school-based leaders need to be prepared to recognize and respond to it. Stop closing your doors. Be proud of what you do. If anyone feels unhappy by anything that’s division-endorsed, shift the conversation. Technology makes this inter-division (inter-province, inter…) collaboration possible; the increasingly challenging teaching climate makes it necessary. I expect my school division to support my learning, and I’m thankful for the support that they offer, but I can’t count on them to be the sole providers of it. Why cheat myself out of the expert down the street? This is a stressful time to be a teacher in Saskatchewan, but it’s an equally exciting one. Walk with me? I love this. I am thankful for colleagues like you(yes, from another division and opposite end of the grade spectrum but a colleague none the less) who teach me, encourage me and motivate me to be better each day. I am inspired to see these new ways to connect and share gaining traction. We are all truly better when we work together. Our journeys diverge and merge continuously but our goals are the same-to do our very best to provide the students of Sask what they need. I’m very thankful for you and #saskedchat group for having open doors to newbie like me, Ed students, to join in the conversation each week. Like you said it in your post, technology makes inter-division, province, generation… Inter-everybody collaboration possible for us and it is fantastic. #saskedchat enable me to meet wonderful and valuable educators without boarders. Because I would be more shy if I met them in person, I think.